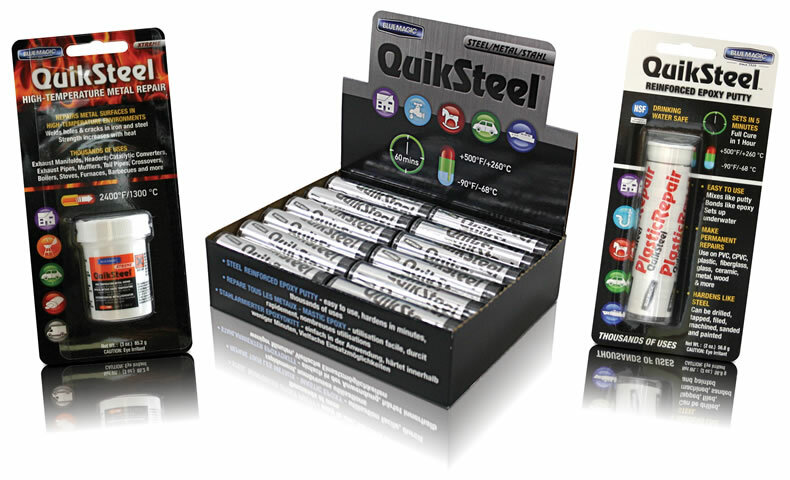 QuikSteel is set to become one of the handiest items to have in the toolbox. It’s a handy putty that can be moulded into any shape or squeezed into a gap or hole and it literally hardens like steel. Just introduced to the New Zealand market by leading automotive products distributor Griffiths Equipment, QuikSteel is a revolutionary product that has already found thousands of uses in overseas markets. It will mend just about anything that’s made from metal, fibreglass, plastic, glass wood, ceramics or brick. “It’s an amazing product and can be used to make permanent repairs to a whole range of things, from fuel tanks, radiators, engine blocks, gaskets and mufflers and even plastic grilles – there’s lots of things it can be used for around the home, too,” says Bruce Walker, Sales Manager for Griffiths Equipment. QuickSteel comes in a tube and the putty-like material can be fashioned into shape before it starts to set in around 4-to-5 minutes. Within 15 minutes it is as hard as steel and is fully cured in one hour. It will even cure under water, so it ideal for fixing radiators or pipe leaks. It can withstand heat up for 260-degrees Centigrade or 500-degrees Fahrenheit, so is ideal for use on very hot surfaces, such as engines or even ovens. Once cured, it can be drilled, filed, sanded and even tapped to take a bolt or screw thread, just like the original piece of metal. QuikSteel has a shear strength of 740 pounds per square inch and a tensile strength of 6,200 pounds per square inch, so is immensely strong. It’s also impervious to chemicals, oils, solvents, including petrol and diesel and most acids, including battery acid, so can be used to permanently repair a cracked or damaged automotive battery casing. And because it’s not actually metal, it does not conduct electricity, meaning it can also be used as an insulating material. ThermoSteel High Heat Repair, a special product that is designed to withstand extreme temperatures up to 1316-degrees Centigrade or 2400-degrees Fahrenheit, which is great for furnaces, fireplaces and barbecues. The QuikSteel ranges of products are now available throughout New Zealand at automotive accessory stores and selected retail outlets.